Siblings and Friends tracked the lives of fifty children from mid-childhood to young adulthood. 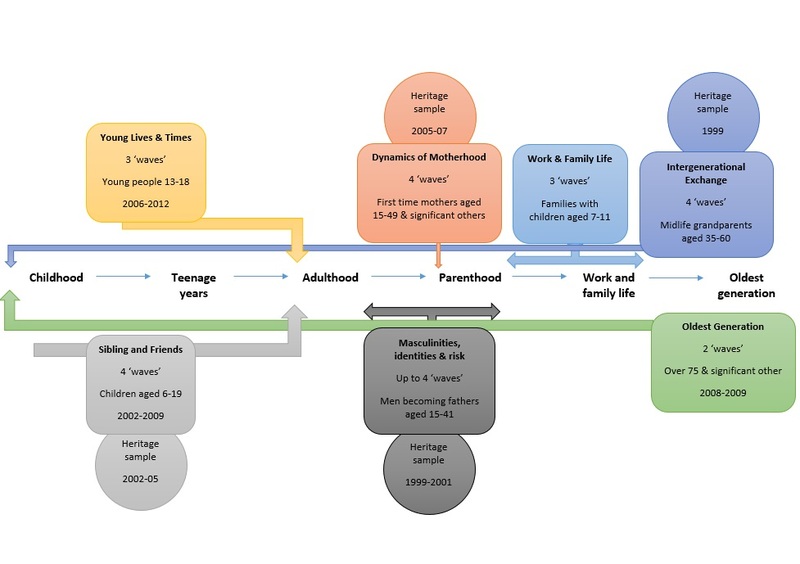 Young Lives and Times followed young people into early adulthood. The Dynamics of Motherhood looked at what it means to be a mother in the 21st century. Masculinities, Identities and Risk explored the change involved in fatherhood. Work and Family Lives explored the ways families reconcile work and family lives over time. Intergenerational Exchange generated insights into how grandparents support and care for their grandchildren in a low income area. The Oldest Generation was concerned with the dynamic nature of older people’s relationships and identities. Collectively, these studies have amassed a wealth of information about change and continuity in relationships, identities and how these are experienced in different social, economic and historical and cultural contexts. A remit of Timescapes was to develop a qualitative longitudinal data resource for sharing and reusing the data collected. This unique, multi-media archive continues to grow, with the incorporation of further QLR datasets.